West Sixth Brewing, sitting on West 6th Street in Lexington, was founded in 2012. It is a craft microbrewery located in a historic 100-year-old bakery. West Sixth Brewing, sitting on West 6th Street in Lexington, was founded in 2012. It is a craft microbrewery located in a historic 100-year-old bakery. Previously housing “The Bread Box”, this enormous mixed use development houses a plethora of interesting companies and organisations. To name a few, there’s the Rollergirls of Central Kentucky (aptly named R.O.C.K), ‘Magic Beans’ coffee roasters, a nonprofit educational, community focussed aquaponics farm called ‘Foodchain’ and much more. This sense of community, of course, is a regular feature of the trip. We met co-founder Brady Barlow for a tour of the facility and to glean from his encyclopaedic knowledge of West Sixth Brewing, Lexington and, moreover, Kentucky itself. “It all started with what I like to call ‘Beer Research’” laughs Brady. The West Sixth idea was born from four acquaintances meeting to discuss, rather vaguely, a new project. It wasn’t until their wives got involved that they decided to pull the trigger and start on something they all shared a passion for: beer. “We were just friends of friends, but we all had particular skills,” explains Brady. From engineering and accountancy to logistics, they were almost tailor-made to open a brewery. The main challenge appeared to be location. Initially requiring 8000 square feet, the Bread Box was simply too big, covering a colossal 90,000 square feet. However, they decided to just go for it. “We now take up 30,000 square feet of the unit,” Brady proudly announces, around four times its initial requirement, and it’s easy to see why such an operation has become so popular. At the front of the building is the substantial taproom. Tripel, there’s plenty of choice for the locals. “We wanted to create a strong gathering place for the local people and local clubs,” explains Brady, handing us an eye-wateringly fresh ‘Heller Heaven’ Double IPA (standing at just 20 hours old). It’s incredible how ingrained the focus on giving back to the community is, even sneaking into the beer itself. “We gave back 170k dollars to the local community last year through various avenues,” Brady says. “One example is our Pay-It-Forward Cocoa Porter; for every six-pack we sell, 50 cents goes back to local organisations.” Impressively, this is matched by the distributors, proving that West Sixth aren’t alone in their local focus; it’s shared by the whole population of the area. 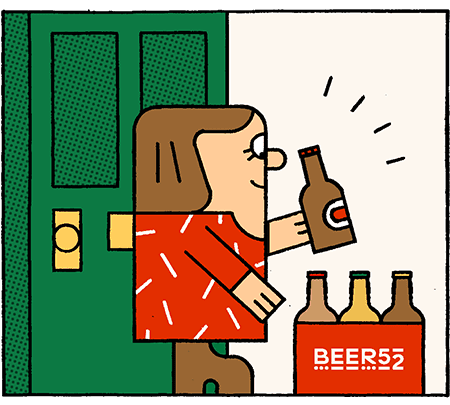 Of course, this beer features in this month’s Beer52 selection, so you get to try it for yourself and, when you do, you can feel smug that you’re helping local (well, local to Kentucky) causes. The beer itself is a true work of art. “Dark and rich with overtones of coffee and dark chocolate” recites Brady, “we add over 60 pounds of organic, fair trade cacao nibs in each batch to give that extra chocolatey quality”. At 6% it’s a fairly strong porter yet incredibly easy to drink. As Brady says: “West Sixth only distributes in Kentucky and Cincinnati for now,” so what you have in your hand is a true UK exclusive and one we’re very proud to bring over and share with our members. Not receiving the mixed box? Not to worry, you’ll have the Lemongrass American Wheat. “We basically have a wood-chipper that we run real lemongrass through, then into a sort of giant teabag into the kettle,”describes Brady. The addition of Sorachi Ace hops further enhances the lemony quality, for a real treat of a beer. Next door to West Sixth, with a handy side entrance for easy access to the taproom, is Smithtown Seafood. Making everything from scratch and with its farm-to-table approach, Smithtown makes familiar cuisine from Kentucky and beyond. Wild-caught fried catfish, fish tacos, oyster wraps and the famous Smithtown All-Kentucky burger. Again, the community approach is a big part of the ethos, with two dollars from my Singapore salad donated to the neighbouring “Foodchain” organisation, an educator of innovative, sustainable agricultural practices. Another lovely element is how you’re able to order from, and eat inside, the West Sixth taproom. Commonwealth not competition, perhaps. Heading back inside the brewery itself, we marvel at the giant tanks and watch the staff methodically laying out our UK shipment of West Sixth beers (conveniently happening on the day we visit). There is an excitement in the air, as this size of shipment has never been exported before. In fact, never has any significant amount of West Sixth beer made it out of the states surrounding Kentucky. “That’s quite a lot of beer,” I blandly contribute, surveying the pallets upon pallets of cans. Ignoring my inane observation, Brady continues: “Everyone who works here is extremely committed to the West Sixth project, we offer health insurance and a range of other benefits,” which can be unusual in the United States. In fact, almost half of non-elderly individuals do not have employer-sponsored insurance. In addition, employees are on the ‘401(k)’ plan, a defined-contribution pension often matched by the employer. The idea, I guess, is that healthy, happy employees make the best beer. It certainly tastes like it. As if West Sixth couldn’t get any more impressive, Brady started to tell us about its new project: West Sixth Farm. 120 acres of rolling countryside in nearby Franklin County, just a 30-minute drive from the brewery itself, lies an incredible new development. West Sixth is aiming to grow a significant proportion of the ingredients for its beers in its own farm. “From fields of hop trellises and barley to raspberries, sour cherries, blackberries,” and much, much more. In true Kentucky spirit, it also aims to use this site as an educational area for children. While they won’t be enjoying the beer (as far as I know) they can learn about cultivating crops, the importance of locally produced products and gain invaluable experience of a big part of Kentucky agricultural industry. The adults among us can try some of the estate-produced beers and hard ciders, an increasingly popular drink in the area. “Hopefully one day all of our ingredients can be purchased from Kentucky proud farmers,” Brady says. A noble quest and one I’m sure the whole area will benefit from. West Sixth is a true bastion of solidarity and community in a modern world where this is often lacking. While I come away thinking how important they are to the local area, in reality they believe the opposite. Without the people of Lexington, there’d be no West Sixth, and its mission is to pay the community back for its support by any means it can. It truly shows how beer can make the world a better place and I’m sure that’s something we can all get on board with.